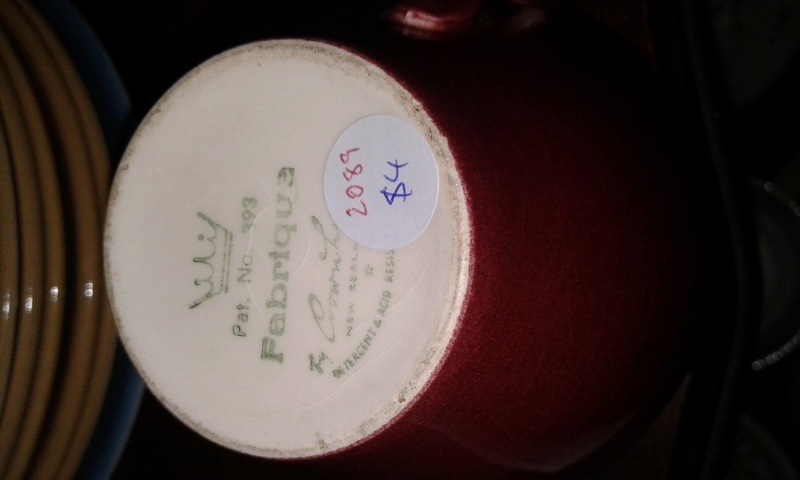 Fabrique d393 - Grey Linen underglaze with Red colour glaze 781 cups. Red Tulip cups..Awesum! will look at fabrique pattern differently now. 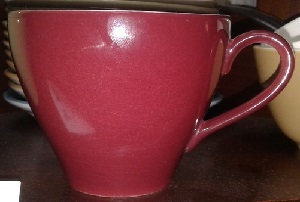 I cannot find a number for the red colour glaze for the life of me, though there has to be one. I will add the colour to the Patterns Gallery as Colour glaze Red. This colour is not seen very often. I thought it was one of the Plum colours when I first saw your photo, but when you mentioned the Fabrique stamp it rang loud bells. 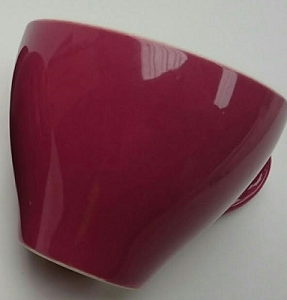 Edits to add that this would be a very collectable cup not only for the rare red colour, but also for the fact that it has the Fabrique stamp on the base which lets us know the name of the colour glaze. 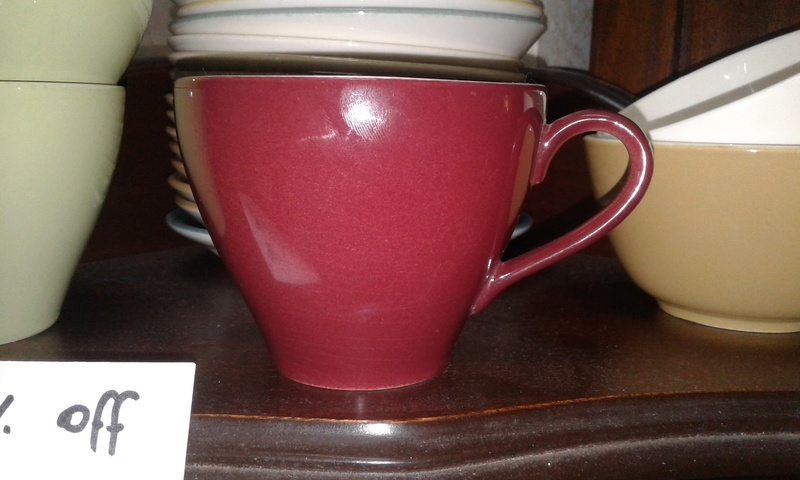 I wonder if it's the same colour as the cup I found in Dunedin? I will try to put them side by side, though with different cameras who knows! 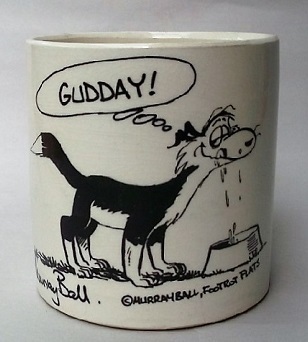 I think Cat said her cup was 'mottled' glaze. Mine isn't. I'm new to these colours so I can't be sure ..... help! 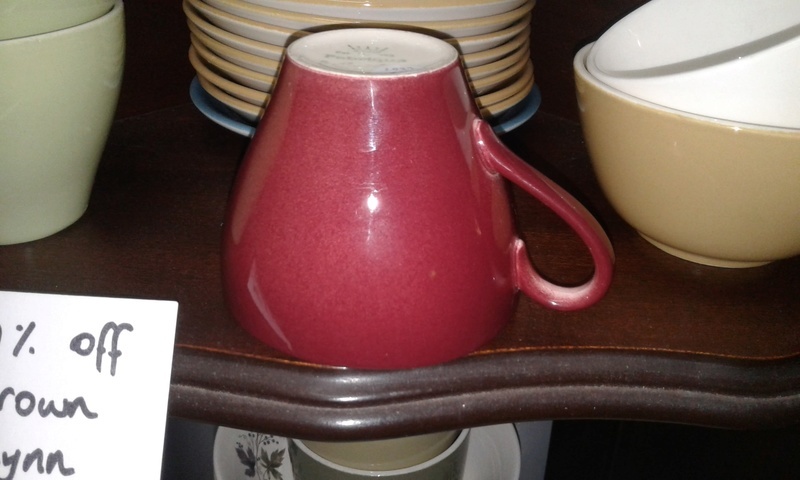 I can see white on the inside of the handles where the glaze didn't reach on both yours and Cat's. I noticed that on Cat's photo. This would have happened when they sprayed the colour on. An easy thing to do and maybe done at the end of a long shift when energy levels were low ..... I think what you see on my photo is reflection from the light through the nova roofing.